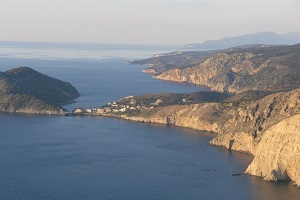 The smell of thyme and olive trees, the hidden crystal water bay, the old picturesque village, the fresh air, oh yes, this is Kefalonia from the less trodden path. Discover the quite side of the island on your own pace or with our guide. If you fancy a walk around the secluded area of Fiscardo, then these 4 self-guided short walks “Agnantia – Old Tselentata Village-Fiscardo”, “The old Venetian Lighthouse of Fiscardo”, “Emplisi – Kimilies” and “Psilitrias-Germenata” will reward you. Pristine coves with turquoise sea waters, hidden paths sheltering a wealth of flora and fauna, old -rich culture- villages along with their churches, and secret historical corners set a magical scenery. Walking notes are provided / Level: from Easy to Medium / Distance: from 300m to 4 km / Duration: including stops and breaks from 30min to 70 min / Altitude: from to 220m to 0m. Starting from the old village of Drapanitika and through the beautiful village of Assos you will reach the peninsula with the Venetian Castle. You will enjoy amazing sea views. Price per person: 24€ (1-4 people), 19€ (4-8 people), 11€ (8-12 people) Level: Easy / Distance: 9 km/ Duration: including stops and breaks 4hrs/ Altitude: start 320m. end 0m. It’s time for you to visit the famous Ainos mountain. 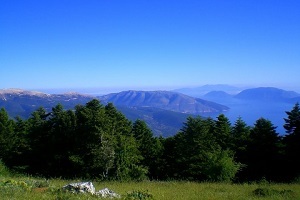 This walking path in Kefalonia is in a high altitude and through a part of the National Forest of Ainos. 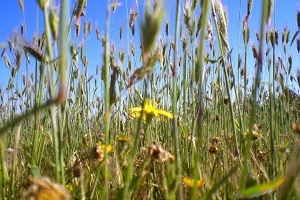 The major part is through a dirt road and a small part on a path. Price per person: 26€ (1-4 people), 21€ (5-8 people), 13€ (9-12 people)/ Level: Easy / Distance: 10 km / Duration: including stops & breaks 4hrs/ Altitude: start: 900m. max: 1110m. end: 615m. 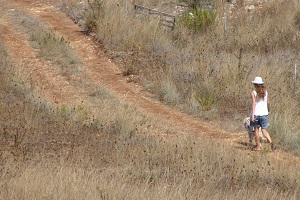 This walking path in Kefalonia is on a dirt road and an approximately 2km distance on a path. You will pass through the old villages of Koulourata, Mouzakata (the remains of the village were destroyed on World War II), Grizata and Zervata that had been devastated by the 1953 earthquake. Finally, you will end up in the Monastery of Agioi Fanentes and in Sami. Price per person: 27€ (1-4 people), 22€ (5-8 people), 14€ (9-12 people)/ Level: Easy-medium/ Distance: 11km/ Duration: including stops & breaks 5hrs/ Altitude: start: 130m. max: 360m. end: 3m. Most of it is on a dirt road with few parts of asphalt. You begin from the Monastery of Themata and then you will walk through the old villages of Vlachata and Poulata( have a glimpse on the everyday life of the residents). You will end up at the lake caves of Kefalonia and Karavomylos area. Price per person: 27€ (1-4 people), 22€ (5-8 people), 14€ (9-12 people) / Level: Easy / Distance: 12km/ Duration: including stops & breaks 5hrs/ Altitude: start: 510m. 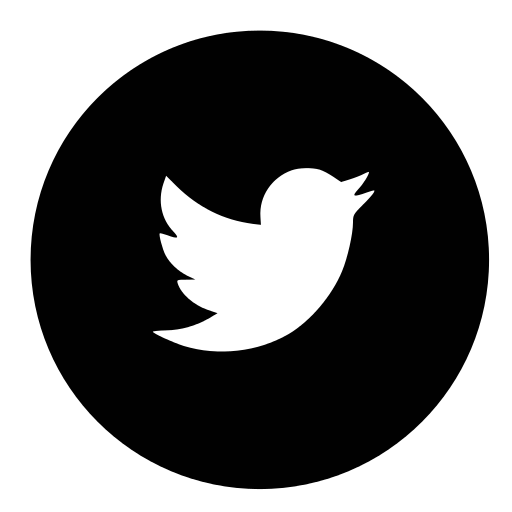 end: 5m. 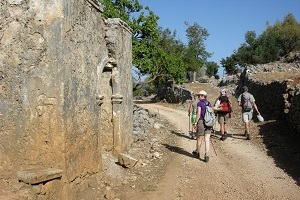 This hike explores the mountainous part of Kefalonia starting from Monodendri. You will visit the Aeolic park of Evmorfia, pass through a small canyon and you will arrive at the village of Chaliotata. 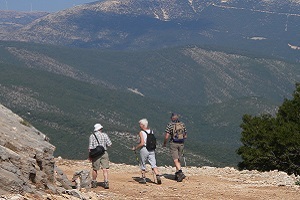 The altitude offers panoramic views. Price per person: 28€ (1-4 people), 23€ (5-8 people), 15€ (9-12 people)/ Level: Medium/ Distance: 17km/ Duration: including stops & breaks 6.3 hrs/ Altitude: start: 718m. max: 850m. end: 170m. 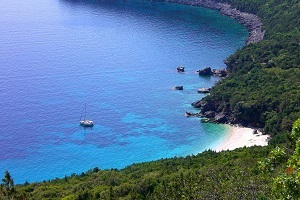 Starting from Antisamos beach, you will pass through Koutsoupia Beach and you will end up at Poros, walking through the most remote part of Kefalonia (south east). The greatest part of the route is a narrow path under the tree shadow. The last part of the walk which is on a dirt road is our hardest walk not only because of the long distance, but also because of the partly difficult path. Price per person: 33€ (1-4 people), 27€ (5-8 people), 17€ (9-12 people)/ Price per person- returning by boat: 40€ (4 people), 32€ (5-8 people), 19€ (9-12 people)/ Level: Medium – Hard/ Distance: 17km/ Duration: including stops & breaks 8.30 hrs/ Altitude: start: 0m. max: 220m. end: 0m. You need to drive to reach the starting point of every walking path but Alexis can arrange a taxi for you.